Is Turkey Getting Ready to Build Its Very Own Stealth Fighter? Nearly every country on the globe with both a large defense budget and pressing security concerns is attempting to either purchase stealth fighters from abroad or develop their own. Turkey now joins India, South Korea and Japan in seeking to do both. Next month on June 21, 2018 the Turkish Air Force is set to receive the first of thirty F-35A Lightning II stealth fighters from the United States—overcoming efforts by members of Congress to block the sale due to growing foreign policy clashes and concerns over human rights. The transfer ceremony will occur in the U.S., as the Turkish pilots receive training at Lockheed-Martin facilities. Turkey invested $175 million in the F-35’s development, and Ankara plans to eventually procure 120 of the fifth-generation attack jets. However, in 2013 Turkey began seriously looking into developing its own TF-X stealth fighter as well. Initially, Turkey considered buying into Korea’s KF-X stealth aircraft program, but that fell through due to Seoul’s limited interested in sharing technology. Recommended: How the Air Force Would Destroy North Korea. Recommended: 10 Reasons No Nation Wants to Fight Israel. Recommended: North Korea Has Underground Air Bases. Turkey instead intends to design its own stealth jet, for reasons both tactical and political. The F-35 is a multi-role strike plane designed to infiltrate enemy airspace, gather and distribute critical intelligence, and attack key targets. It is less optimized than the preceding F-22 Raptor for tackling enemy fighters, especially in shorter-range engagements where the Lightning’s stealth characteristics become less salient and its mediocre kinematic performance causes more problems. Turkey, however, would like an air superiority-focused fighter to complement its F-35s. In the political realm, the Turkish government’s long running slide into authoritarianism and diverging foreign policy objectives with Europe and the United States have led politicians in both to begin opposing continued technology transfers. Turkey has even dangled the release of foreign political prisoners as a quid pro quo for arms transfers. The situation doubtlessly is reinforcing Ankara’s desire for an indigenous technological base and weapons systems that may be less disrupted by chilling relations with Europe and the United States. The TAI TF-X is intended to be a twin-engine, single-seat low-observable air-superiority fighter with secondary ground attack capability, much like the F-22. Stealthy features would include an internal weapons bay (as externally mounted weapons increase an aircraft’s radar cross section) and an advanced carbon-composite fuselage which will be less radar-reflective. The Turkish manufacturer TAI is supposed to produce a flying TF-X prototype by 2023, with the first of an envisioned 250 production aircraft leaving the factory floor in 2029 and entering service in 2031. These would eventually replace the Turkish Air Force’s fleet of 245 single-engine F-16 fighters. The TF-X would remain in service into the 2070s, serving in a complementary role to Turkish F-35s. Founded in 2005, Turkish Aerospace Industries (TAI) is not an instantly recognizable name like Boeing or Dassault. Originally devoted to license-building Turkish F-16s, TAI continues to produce avionics and components (including F-35 parts), drones and Turkish variants or modifications of foreign-built aircraft. However, TAI has only fully designed one manned airplane: the Hurkus, a turboprop two-seat trainer/light attack plane similar in concept to the Super Tucano. While TAI has license-built F-16s, designing an entirely new jet from scratch, let alone a stealth plane, will amount to a major leap for the company. The TF-X currently is conceptualized with a design that somewhat resembles an F-22 with its canted tail fins. Earlier iterations of the TF-X concept developed with the Swedish Saab firm envisioned a family of single and twin-engine aircraft. In January 2017, British Prime Minister Theresa May and Turkish President Tayyip Erdogan publicly signed off on a £100 million ($137 million) contract for BAE Systems to advise and assist TAI in the development the TF-X, with follow-up contracts likely down the line. Then in February 2018, Ankara announced it had committed the equivalent of $1.2 billion and over 3,200 full time employees to the T-X’s development. TAI released specifications in 2017 indicating the aircraft will measure 17 meters long, have a 12-meter wingspan, and a maximum take-off weight exceeding 30 tons (MTOW of the F-35 and F-22 are 35 and 41.5 tons respectively). Performance wise, the TF-X is intended to have a maximum speed of twice the speed of sound, a service ceiling of 55,000 ft, and range approaching 700 miles, the former two characteristics exceeding those of the F-35. Additionally, the Turkish firm ASELSAN has been subcontracted, and is working on a domestic gallium-nitride Active Electronically Scanned Array (AESA) radar. AESA radars are the cutting-edge in aerial sensors, as they boast high resolution while having a low probability of intercept by hostile radars. ASELSAN already manufactures a variety of defensive avionics, so its speculated it may also contribute digital-frequency jammers and components such as Radar Warning Receivers to the TF-X. The TF-X will also reportedly sport an advanced glass cockpit with voice-command interface and datalinks so that it control up to two friendly IAI Anka drones, which may be developed to fire air-to-ground or air-to-air missiles. This could enable tactics wherein the stealth fighter stalks targets at long range, where it is least likely to be detected, then dispatches the drones to release weapons at shorter range without exposing the command vehicle to retaliation. Furthermore, Turkey hopes the TF-X will attract export orders. For instance, in 2016 it was revealed that Turkey had formally invited Pakistan to buy into the program and contribute some of its own design experts. If the TF-X program is successful, Pakistan—which also will eventually need to replace its F-16s—might naturally be interested in acquiring stealth jets to gain a qualitative edge over the Indian Air Force. Then again, depending on how the TF-X project fares, Pakistan will also have another option in China’s export-oriented J-31 Gyrehawk. High-performance turbofan engine remains one of the greatest technical hurdles to building a successful jet fighter. TAI’s specs call for two engines with at least 20,000 pounds of thrust. In 2015, Turkey signed memorandum of understanding suggesting it might select the Eurojet EJ200, the engine used by the Eurofighter Typhoon. Reportedly, they would have procured a version upgraded to produce 27,000 pounds of thrust and incorporating thrust-vectoring capability, a technology in which the jet’s exhaust nozzles can shift their angle to enable tight maneuvers. The desire for such powerful engines suggests Turkey wants the TF-X to be capable of supercruise, or maintaining supersonic speeds without resorting to fuel-gulping afterburners. However, in December 2017 Eurojet withdrew from the TF-X bid. Reportedly, the European consortium objected to Turkey’s changing demands to transfer technology that Turkey could use to develop its own jet engine. There was also some speculation that the withdrawal was due to German reluctance to authorize the program in the light of recent political events- events which also led to the scrubbing of an upgrade to Turkish Leopard 2 tanks. For these reasons, TAI is currently considering a few other bids. One is a 49-51 percent joint venture between Rolls Royce and the Turkish Kale Group. Rolls Royce developed the XG-40 engine on which the EJ-200 is based; however, there remain concerns over the extent of the technology transfer requested by Turkey. Another route is to have the domestic Tusas Engine Industries (TEI), which license-manufactures the F110 engines used in F-16s, develop its own turbofans. Finally, the Russian state-owned corporation Rostec, owner of Saturn which manufactures the AL-31 and AL-41 turbofans for Russia’s Flanker and Su-57 fighters, has expressed interest in developing thrust-vectoring engines for the TF-X. This is a possibility given previous Turkish-Russian arms deals. For example, Turkey recently scandalized its North Atlantic Treaty Organization (NATO) allies by opting to purchase Russian S-400 surface-to-air missile systems, rather than acquire a system designed to integrate with NATO’s air defenses. Turkey’s passing on existing engine technology in favor of a new design seems likely to add risk and cost to the TF-X, but would allow Ankara to retain ownership of the engine, and perhaps design stealth-optimized jet intakes and nozzles. Exposed radar-reflective turbofan blades are an Achilles heel in modern fifth-generation designs such as the Su-57. Another possibility is that an off-the-shelf engine might be used for prototypes or early production models, while an indigenously designed engine undergoes development. How Realistic is the TF-X? 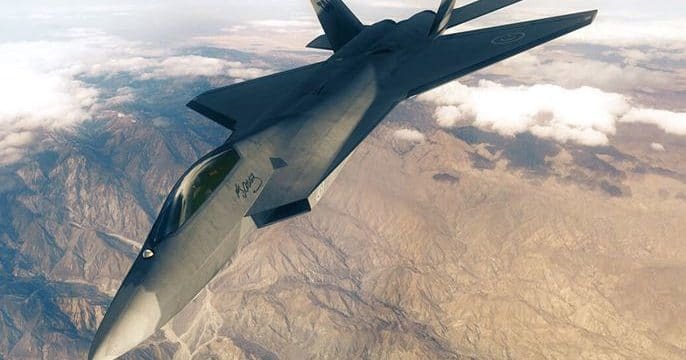 The underlying question remains whether Turkey can develop a stealth jet much more cheaply than other countries with a more extensive experience and technological base. For example, the United States spent over $40 billion developing the F-35, and Japan estimated that developing its own F-3 stealth fighter would cost a similar amount—a bill it’s Self Defense Force is reluctant to assume.